Known in Japan as namban-nasu, this delicious dish can be prepared up to a day in advance. In a medium pot, combine the rice vinegar, sugar, soy sauce and salt, and bring the mixture to a boil, stirring. Add the chili peppers, and remove the pot from the heat. Transfer the marinade to a medium flat-bottomed container, and set it aside. Stem and cut your eggplant lengthwise into quarters. 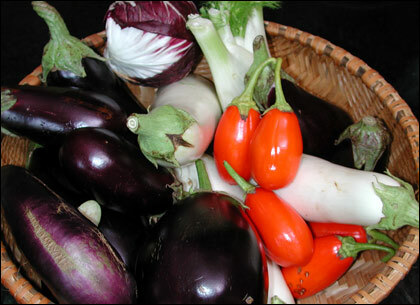 (If you are using a large American eggplant, cut it in half crosswise, and then lengthwise into 6 pieces.) 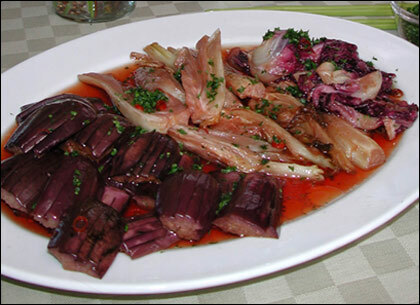 Also cut your fennel bulbs and radicchio	lengthwise into quarters. In a large, deep pot or a wok, heat 2-inches of the vegetable oil to 350 degrees Fahrenheit. Add the vegetables and cook in small batches until lightly golden, about 2 minutes. Drain the vegetables well in a colander to remove excess oil. While the vegetables are hot, transfer them to the marinade. Let the vegetables cool in the marinade, then cover the container with plastic	wrap and store it in the refrigerator. When ready to serve, garnish the vegetables with minced parsley. This segment appears in show #2725.